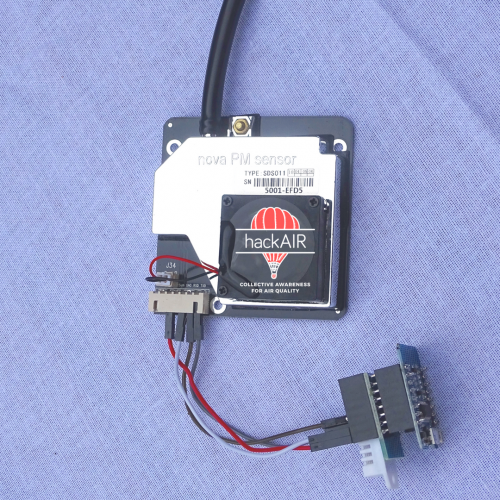 All you need for your own hackAIR home sensor: Sensor, electronics, wires, tube, how-to-tutorial. The sensor comes soldered and programmed – just connect it to your WiFi. 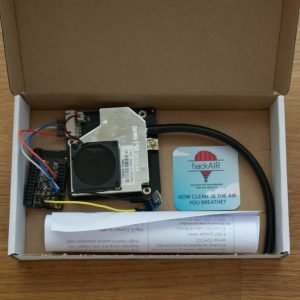 This package contains all materials for your hackAIR home v2 sensor – soldered, assembled and programmed. You will need to add a case (for inspiration see here) and find a location to hang it within reach of your WiFi network and power cables (balconies work great). Once connected, the sensor automatically measures air quality in your neighbourhood (PM10 and PM2.5) and uploads the measurements to the hackAIR platform, so that you can see your measurements in context. You can also easily download your measurements over time.